A lever is a rigid object that is used with an axis to either multiply the mechanical force (effort) or resistance force (load) applied to it. The efficiency of the lever is called mechanical advantage (MA). The greater the mechanical advantage, the less effort required. Mechanical advantage can be calculated by dividing the effort arm by the resistance arm (MA = EA/RA). In assessing the efficiency of the lever (mechanical advantage), it is important to identify and quantify the components included in the system. This can be achieved by calculating the distance between the axis and the where the force acts. The location of these 3 components determines the mechanical advantage and the lever class. It’s important not to confuse this with moment and torque, which will be discussed in the next post. 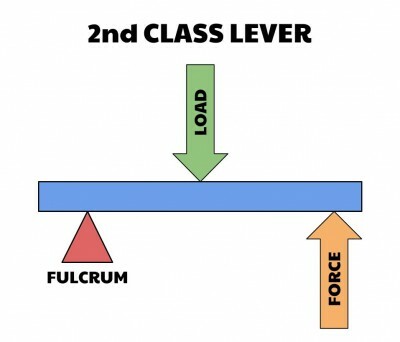 The fulcrum is located between the applied force and the load. Classic examples are a seesaw or crowbar. There are very few in the human body. A rare example is the force of the triceps at the olecranon. 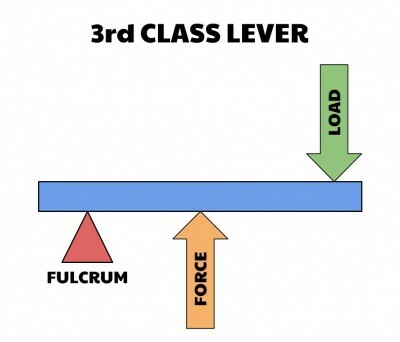 The load is situated between the fulcrum and the force. Therefore the force lever arm would always be greater than the load lever arm. Classic examples are a wheelbarrow, push-up exercise, or nutcracker. This class commonly occurs in the body when gravity, an external force, and or inertia is the effort force and muscles are the resistance (load). In this situation the muscle is contracting eccentrically against the force. Think of an eccentric biceps curl. Another circumstance where this class occurs is when the muscle is acting on its proximal segment while the distal segment is fixed (weight bearing). The result is movement of the proximal lever. An example of this type of 2nd class lever is triceps surae lifting the body around the axis of the toes. 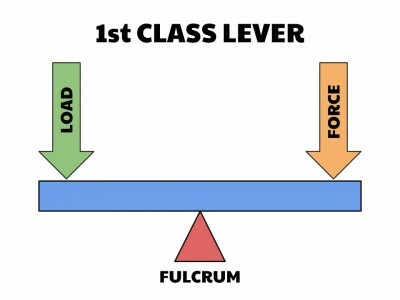 The force is applied between the fulcrum and the load. Therefore the load lever arm is always greater than the force lever arm. A classic example is a pair of tweezers or a diving board. Most muscles in the human body are 3rd class levers and create rotation of the distal segment. With this type of leverage the muscles would be acting concentrically, as long as the distal lever is free. An example of this type of lever system is the biceps brachii acting concentrically on the forearm. It may seem confusing that most of the muscles in the human body are 3rd class levers, since these levers are at a mechanical disadvantage in terms of effort versus load. However, this only holds true in terms of resistance. The opposite is true when you consider the distal lever displacement. A small arc of motion proximally at the muscle insertion will create large angular displacement and velocity distally. Since most human movement is aimed at maximizing angular displacement of a distal segment through space, the use of 3rd class levers for is very efficient. This creates a relationship between the lever arm distance, distal angular displacement/velocity, and torque production. The shorter the lever arm of the effort force (decreased mechanical advantage), the greater angular displacement and angular velocity of the distal end of the lever for a given arc of displacement of the effort force. The larger the lever arm of the effort force (increased mechanical advantage), the increased torque production. This lever arm and force/torque production relationship needs to be taken into consideration when assessing movement and prescribing interventions. For example, applying a 5 pound weight at the distal end of a lever during a scaption/SLR exercise creates a mechanical disadvantage for the supraspinatus/illiopsoas. This results in the muscle being overloaded in attempt to create the amount of torque necessary for the distal angular displacement. Understanding lever systems are a very important part of biomechanics. It helps to conceptualize the amount of effort force required for movement and also can determine the efficiency of static and dynamic positions. Once you determine the lever arm system, you can then begin to quantify moment and torque. This is an awesoke work. I never understood lever system better way than this before. Can call a deadlift a 2 class lever? awesome!! i got great concept. a very helpful website. perfect images to describe the lever ect.